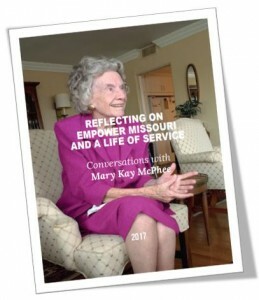 Mary Kay McPhee of Kansas City accepted, at the age of 90, the invitation of Empower Missouri to be interviewed about her life of service. She embodies the Empower Missouri slogan of advocating for justice and empowering change. In her ethical will and the conversations documented here, she shares her life, values, and hopes.